Mayor Jones, along with Delegate Delores McQuinn, Councilwoman Cynthia Newbille, Virginia Union University President Claude Perkins, Joy Bailey of LORD Cultural Resourcs, and Matt Laird of the James River Institute for Archaeology spoke on Thursday, August 13, 2015 about the importance of the Slave Trail improvements and the plans for Lumpkin's Jail moving forward. The following are Mayor Jones prepared remarks. Good afternoon. I am so pleased to be here today to talk about the progress that has been made by the Slave Trail Commission. I especially want to thank Delegate Dolores McQuinn for her introduction. Her passion and labor for this commission’s work is why we are as far along as we are today. I also want to thank Councilwoman Cynthia Newbille and Dr. Claude Perkins from Virginia Union University for being here. Additionally, I want to welcome Joy Bailey Bryant from LORD Cultural Resources and Matt Laird from the James River Institute for Archaeology. Thank you for joining us. Since the Slave Trail Commission was established in 1998, it has been tasked with not only preserving the history of slavery in our city, but helping tell the story that has been overlooked for far too long. Because of the hard work of this group, the city has tangible memorials and increasing opportunities to tell a fuller picture of our history. Over ten years ago, the slave trail commission began branding and design work and began distributing brochures throughout the community and tourism centers. In 2006, there began an archaeological assessment of the Lumpkin’s Jail site in Shockoe Bottom and two years later, an archaeological excavation backfilled the site to protect it until it can be safely revealed. What is there today is a commemorative landscape and interpretation of the original site. In 2009 through 2011, the commission conducted extensive community engagement and research to create the 21 historical markers that are presently along the trail. Then in 2014, my administration secured $11 million from the Commonwealth of Virginia to begin to develop a heritage site at the site of Lumpkin’s Jail and the burial ground. Working with Richmond City Council, the City has committed another $8 million to this project, for a total of $19 million – a level of financial support that his project has not had before. This funding has helped us with the latest in a long series of accomplishments, which is the installation of the 53 new path markers along the trail. These markers are just the beginning of the improvements that this funding will allow us to move forward with. I want to thank the General Assembly for their commitment to making enhancements to the slave trail. Standing here, at the beginning of the Slave Trail at Ancarrow’s Landing, I also want to thank and acknowledge the Exxon Company for the improvements that we can see have been made at this site. Exxon has made this site safer, more accessible, and beautiful. When I take in the various improvements that have been made and the work that has been done, I just want to say that we must keep this momentum going. That is why I am announcing today that we will begin the process of making the first phase of the heritage site a reality. The location of Lumpkin’s Jail, also known as the Devil’s Half Acre, was the holding site for slaves before they were taken to auction houses and sold. During Robert Lumpkin’s ownership, the site was known for being a particularly cruel place. Those who tried to escape were publicly beaten and tortured. However, out of a site of unspeakable and detestable acts grew a place of higher learning with the founding of Virginia Union University. The site went from the Devil’s Half Acre to God’s Half Acre. I have always found solace that despite the abhorrent treatment that the slaves in our city had to endure, something beautiful and important has grown. In this year, the 150th anniversary of the Emancipation and the founding of Virginia Union University, I can think of no better way to honor our heritage than to begin to build up the telling of our story, a fuller and more complete history of our city and our country. However, we cannot do this in a vacuum. A complete history cannot be told only in an academic setting. We cannot build a world class pavilion without world class community participation. I am excited to announce that we will be holding the first in a series of community engagement opportunities on September 10th at Martin Luther King Middle School. We will also be hosting a meeting at Huguenot High School on September 15. 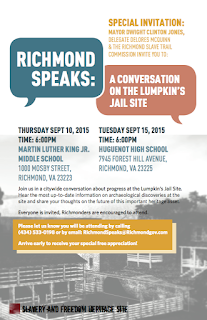 Our series is called Richmond Speaks, and will essentially be a citywide conversation about the Lumpkin’s Jail Site. Joy Bailey Bryant, of Lord Cultural Resources has been engaged to lead this process. Joy led the process during the first phase of the commission’s public engagement and I am so pleased that she will be leading this phase as well. At this time, I’d like to bring her up to provide more information about our public engagement efforts. Mayor Jones, Delegate Delores McQuinn, and the Richmond Slave Trail Commission invite all residents to participate in "Richmond Speaks: A Conversation on the Lumpkin's Jail Site". Here is the flyer for "Richmond Speaks". Mayor Dwight C. Jones provided a progress report of the Richmond Riverfront Plan implementation. Citing several Phase 1 projects nearing completion, Jones spoke about the Richmond resurgence detailing progress made along the riverfront. The Riverfront Plan was adopted in 2012 and the Jones Administration provided initial funding in the Fiscal Year 2013 Capital Improvements budget. Highlighted projects discussed during today’s press conference included the Lehigh Silos demolition, the Virginia Capital Trail, the T. Tyler Potterfield Memorial Bridge, the Low-Line, and Terminal Dock improvements. Jones noted significant progress, calling it an exciting time for the city. Along with removal of the silos, plans have been announced for Port of Richmond improvements, the Low-Line project with CSX and Capital Tress is underway, improvements are being made to the Intermediate Terminal structure, final plans have been approved and the work has begun on the Tyler Potterfield Memorial Bridge and the Richmond portion of the Virginia Capital Trail will be completed by the end of August. Investment in the Richmond portion of the Virginia Capital Trail totals $4 million. The City has contributed $820,000 of that costs. The City also invested $200,000 in the Low-Line project, while CSX and Capital Trees are providing the rest of the funding. Terminal Dock investments over two years amounts to $2.9 million and the Lehigh Silos demolition is expected to cost $740,000. The City has approximately $10 million available for Phase 1 Riverfront projects, which includes the T. Tyler Potterfield Memorial Bridge work. Demolition crews will begin removal today of the sheds at the 17th St. Market (Farmers’ Market) in the first phase of planned improvements to open up the space into an expanded public market. The work is part of the Shockoe Bottom Revitalization Strategy – a process which included public engagement and recommended removal of the existing sheds to position the space as an open urban square conducive to flexible programming. The City’s Department of Economic and Community Development (ECD) has engaged Pryor Hauling, Inc., for the removal of the sheds. While fencing will be placed around the project site, no streets are scheduled for closure during the shed removals. Existing produce vendors at the 17th Street Market will be moved to the Main Street side of the market where they can continue to set up stands. Plans include salvaging and re-purposing the sheds, which will be coordinated by Enrichmond. The Shockoe Bottom Revitalization Strategy was commissioned by the City of Richmond in 2010 to provide a strategic framework for revitalization actions. A charette (Public Workshop) was convened, as well as stakeholder interviews and a developer symposium in 2010/2011. Recommendations for the existing under-performing market included developing the space into a functioning urban square. A new public market ties in well to core identity themes for Shockoe of food, entertainment, entrepreneurship, and history. Plans include a combination of spaces that includes a permanent structure housing a year round public market of food, crafts and other items; outdoor or open areas serving as an expansion area for seasonal markets (farmers market, holiday market), programmed activities and events; and space for any administrative or small business development activities associated with the market. As one of the oldest neighborhoods in Richmond, Shockoe has evolved from a river commerce center, to an industrial complex, to today’s reviving urban housing and entertainment district. Both the recent Downtown Plan and the Comprehensive Economic Development Strategy build on this momentum, setting direction for future development in Shockoe. Current initiatives including the Slave Trail and Lumpkin's Jail Pavilion, enhanced rail service, improvements to the historic Main Street Station Multimodal Transportation/Travel and Welcome Center, and planning for increased arts and cultural attractions all outline the promise and potential of Shockoe for Richmond. The initial work on the 17th Street Market is expected to take two to four weeks to complete. All the sheds, with the exception of the middle bay and the end bays on Franklin and Main Streets, will be removed. During the next phase, ECD will seek proposals to manage, operate and brand the 17th Street Market.